1 of 2 Remove 1 1/4 pounds green grapes from their stems. Freeze at least 3 hours. 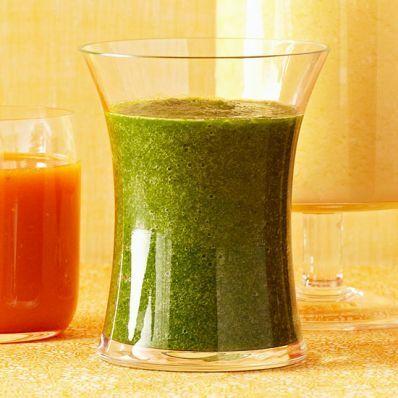 2 of 2 In a blender, combine half of the frozen grapes; 3 cups packed baby spinach; 1 Granny Smith apple, peeled, cored and chopped; and 3 cups pear nectar or apple juice. Blend until smooth, adding remaining grapes while blender is running. Per Serving: 3 g fiber, 26 mg sodium, 0 g sat. fat, 0 mg chol., 0 g Fat, total, 160 kcal cal., 1 g pro., 42 g carb.